Here I am to reveal the biggest beauty secret for 40+ women. I have finally figured out what it means beauty from the inside out. Surely it is also about personality and values but let’s leave that aside for a moment and let’s talk about skincare. The only way to keep a woman’s skin young for longer is by introducing collagen supplements in the diet supported by a healthy nutrition. Is there such a thing as Ski Fashion for mums and kids? Well, of course there is. 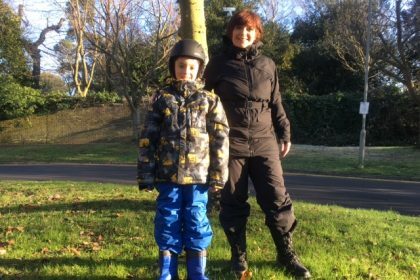 No matter where I go, I love wearing good looking clothes that are flattering for my not perfect round figure and I also want my son to feel comfortable while doing sport. It’s been a couple of years since my last skiing holiday so now it’s time to get my heads round to prepare the right equipment and active wear for a sporting week in the cold. Last time we went I realised too late that I did not have the correct clothing and gear and as a result I felt cold most of the time, which prevented me to enjoy many fun outdoor activities. But this year, I got organised and found everything we need for our skiing holiday. I come to the rescue with my top beauty essentials for the party season. Lots of my friends have asked me so I hope you’ll find my list useful. I spent the best part of Summer outside on the beach. Unfortunately, soaking up sunshine and chlorine damages our skin and shows in your complexion in the autumn and winter months. For mature skin (like mine), the sun leaves behind uneven pigmentation and age spots as well as an increased risk of lines and wrinkles. So this Winter I have desperately searched for the best products to keep my skin hydrated (but not greasy) over the cold season as well as restore and nurture my dull or damaged skin in time for the next Spring and Summer.